How to install Oxygen OS, Hydrogen OS, or Open Beta onto OnePlus 5/5T/3/3T? Leave a Comment on How to install Oxygen OS, Hydrogen OS, or Open Beta onto OnePlus 5/5T/3/3T? One of the most popular China-based smartphone manufacturer, OnePlus, has already rolled out the latest Android 7.0 Nougat based Oxygen OS 4.0.1 firmware upgrade to its flagship phones including OnePlus 3 and the 3T. Moreover, the Oxygen OS 4.0.2 has also been confirmed. Alternatively, the company has also released the beta testing version under its Open beta program. However, switching between the two firmware is not possible using adb sideload method. Upgrading to latest Open Beta 10 from Oxygen OS 4.0 is possible via adb sideload. However, restoring the official stock OOS 4.0.1 via sideloading is not possible. This tutorial will show you how to do it with a simple Android application and without any data loss and even with a locked bootloader. Flashing Hydrogen OS from Oxygen OS and vice versa. Going from Oxygen OS to Hydrogen OS. Switching between Oxygen OS, Hydrogen OS, Open Beta. Does not require root access or a rooted device. Works on both locked as well as an unlocked bootloader. No need to go into entering commands trough terminal. Works for both OnePlus 3T and OP 3. No data loss – all apps, data, and settings available. Use any firmware Oxygen OS, Open Beta, or the Hydrogen OS. If your device is running Open Beta 10 or the Beta 1 for OnePlus 3 & 3T respectively, the sideload method fails for most of the users to switch back to the stock official Oxygen OS 4.0.1. This guide will show you exactly how to easily switch between the Beta version, official Oxygen OS, and the Hydrogen OS as well. How to install Hydrogen OS or Oxygen OS via Local Upgrade method? First, download the full stock firmware for OnePlus devices. Transfer all the files to phone’s internal storage in the root directory. Do not put it in any folder. See the image below. Now visit Settings > System update > Tap on Settings icon > Choose local Upgrade. Launch the Local Upgrade app and search for an upgrade package. 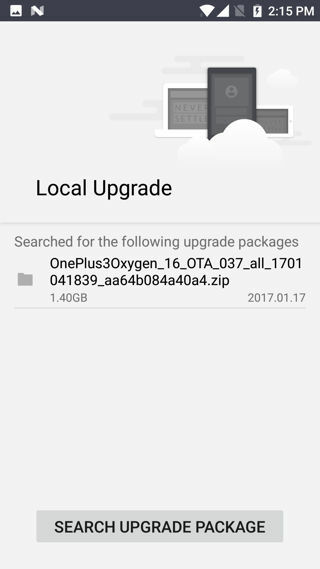 Install Oxygen OS, H2OS, or Open Beta using Local Upgrade APK? First, download the full stock firmware file form your Oneplus 3/3T. Next thing you will need it the Local upgrade application. 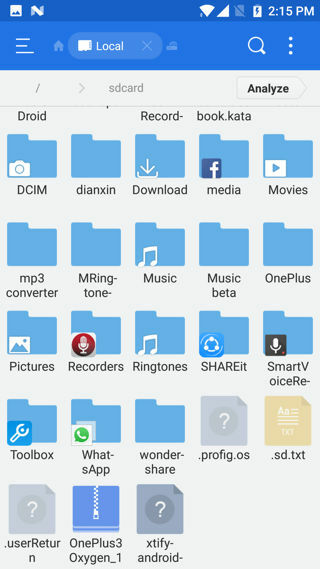 Transfer all the files to your OnePlus’ internal storage. For reference, we have installed the OnePlus 3 Oxygen OS 4.0.1 over the Open Beta 10. You can later revert back to the Beta version using the same procedure or even install the Hydrogen OS based on the Android 7.0 Nougat. Download and transfer the OnePlus 3/3T stock firmware into sd card root directory. Do not put it in any folder. See the image below. 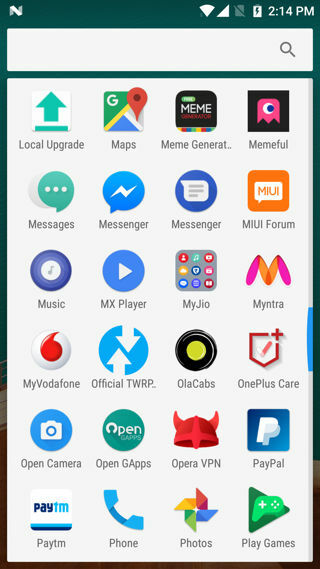 Now download and install the Local Upgrade Android application on your OnePlus device. The device will automatically reboot and perform an upgrade. The installation may take a few minutes. But the device will surely boot. If it doesn’t, you may want to perform a factory reset. However, doing so may result in loss of data. So be patient and let the upgrade do its thing. You may use the adb sideload method to go from OOS 4.0 to Open Beta. Also, see how to install OnePlus OOS/Beta update via TWRP. Next Entry How to Download Samsung Galaxy S7 (Edge) Android 7.0 Nougat G935FXXU1DPLT firmware?